We have many different blanket looks, yarns, and maintenance. Look through to find what suits you best. 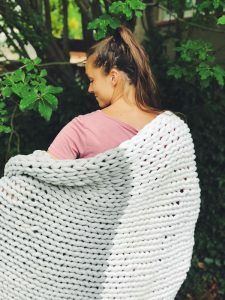 The Alice Blanket is unique to Made With Cozy. 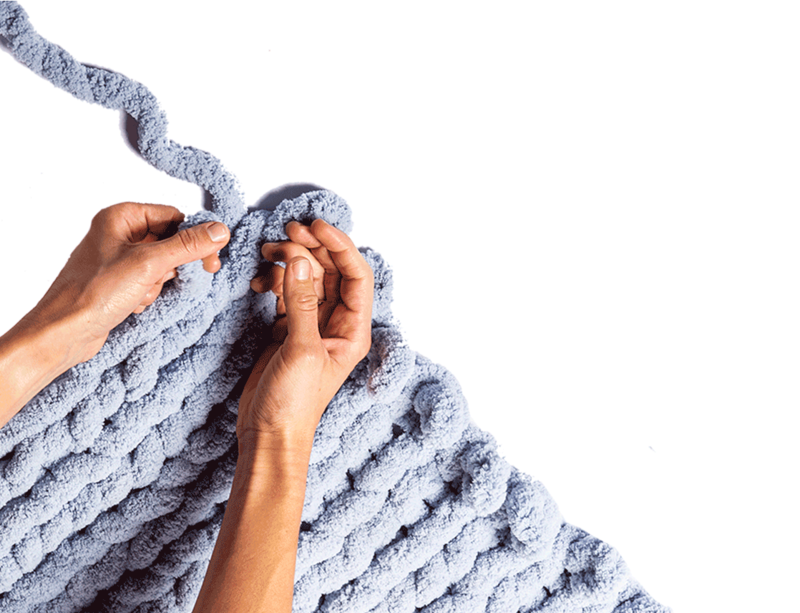 Our extra chunky chenille yarn cannot be found anywhere else! 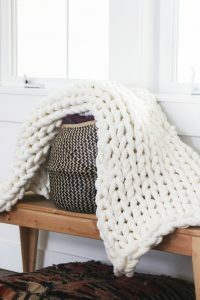 This blanket is made of 100% polyester chenille yarn. It is sized at about 50″x60″. Because of the nature of hand knit blankets, the sizes may vary slightly. 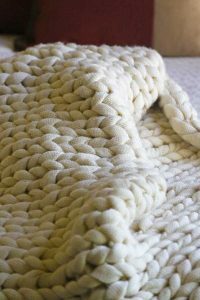 The CoCo Blanket is made of 100% polyester chenille yarn. It is kid, pet, and family friendly. It is very warm and flowy. It is sized at about 50″x60″ with the Grande being sized at about 60″x80″. Because of the nature of hand knit blankets, the sizes may vary slightly. 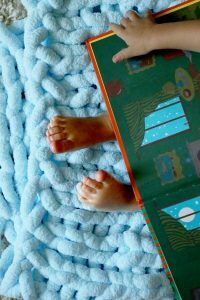 The Roo Blanket is made of 100% polyester chenille yarn. It is perfect for your little ones. It is sized at about 30″x40″. Because of the nature of hand knit blankets, the sizes may vary slightly. As a reminder, please don’t leave blanket with sleeping babies. 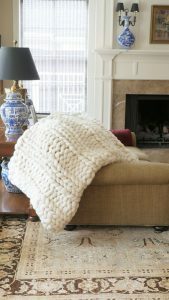 The Peter Blanket is a cotton blend yarn imported from Spain. It is very flowy, and slightly heavy. This is a kid and pet friendly blanket. It is sized at about 50″x60″. Because of the nature of hand knit blankets, the sizes may vary slightly. The Romeo Blanket is made of 100% superwash merino wool. This wool blanket is machine washable. It is heavy and very warm. It is sized at about 50″x60″. Because of the nature of hand knit blankets, the sizes may vary slightly. The Mary Blanket is made of 100% Austrian merino wool. It does shed due to the nature of the unseen fibers. However, it is a stunning piece of decor as well as one of the safest and warmest blankets you will ever own. It is sized at about 50″x60″. Because of the nature of hand knit blankets, the sizes may vary slightly.